Is this the start of a fiber backbone? Walter Baluja, Director of the Computer Science Department of the Ministry of Higher Education has announced that starting January of 2016 all academic centers in the country will have access to fiber connections. I take that to mean ETECSA will offer them fiber connections, not that all will accept the offer, but I could be wrong. There are two campuses (u in the above map) in Granma and one in Pinar del Rio, so I would guess there is now fiber between Bayamo and the undersea cable (c) at Siboney. There may also be fiber to the second Granma campus in Manzanillo. Similarly, there is probably fiber between Pinar del Rio and a satellite ground station (s) in Havana. 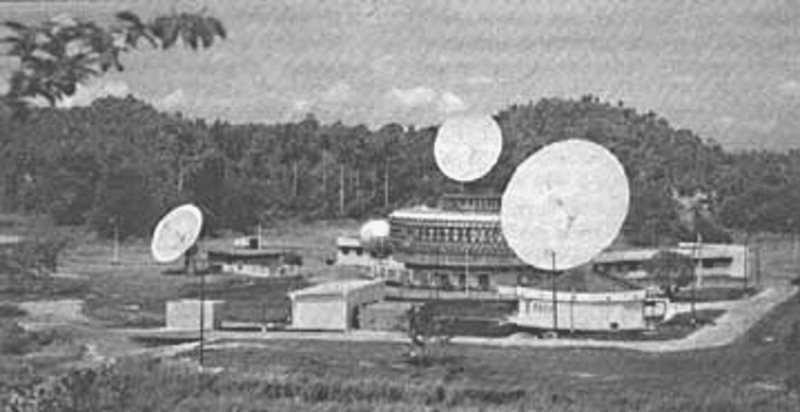 I don't know the location of the Havana ground stations, but found this old picture of a ground station near Havana that communicated with Intersputnik and Intelsat satellites. Baluja said the connected universities have already increased their payment to ETECSA to expand connectivity from "2 to 20 megabytes." I am not sure what he meant by that. First of all, it is common to use megabits per second as a measure of communication speed. Regardless of bits or bytes, 20 is way too slow for fiber links to the campuses. Maybe he was trying to say users were getting 20 mbits per second in labs and offices. He also said they would be installing WiFi LANs on the campuses. Reading between the lines of press releases is tiring and error prone, but this seems to indicate that Cuba is building a fiber backbone. (I've seen a presentation slide showing planned fiber between Bayamo and the undersea cable). Chinese equipment is being used for DSL to the home and Wifi access points. I wonder if Chinese equipment is being used in these fiber links. If so, how is Cuba paying for it and what, if anything, are they giving up? Oh -- and where does that leave US vendors? Almost all of Cuba's international traffic is now being carried over the undersea cable at the eastern end of the island, so I guess there is a backbone network connecting Havana and other large cities to the cable landing at Siboney Beach. Today, that is probably a mix of fiber and wireless links. If there is to be fiber to every university by 2016, does that imply a fiber backbone for the entire island or are some of those fiber links to microwave towers? The same question comes to mind with respect to the WiFi access points in every province.